Go to original pattern for design DROPS 199-5. 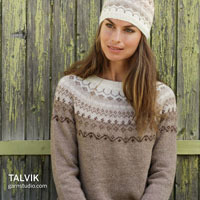 Knitted jumper with stripes in DROPS Alpaca. Sizes S - XXXL. 16 stitches in width and 20 rows in height with stocking stitch and 2 strands = 10 x 10 cm. DROPS DOUBLE POINTED NEEDLES SIZE 5.5 MM. DROPS CIRCULAR NEEDLE SIZE 5.5 MM: Length 40 cm and 60 cm or 80 cm for stocking stitch. DROPS DOUBLE POINTED NEEDLES SIZE 5 MM for rib. DROPS CIRCULAR NEEDLE SIZE 5 MM: Length 40 cm and 60 or 80 cm for rib. A) DROPS Alpaca 100, 501, 2915. B) DROPS Alpaca 100, 2020, 2923. C) DROPS Alpaca 100, 9020, 3112. D) DROPS Alpaca 100, 9021, 6347. 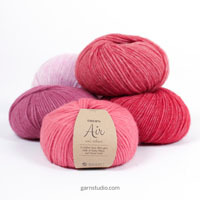 You can get the yarn to make this pattern from	35.20£. Read more. To work out how to decrease evenly, count the total number of stitches on needle (e.g. 144 stitches) and divide by the number of decreases to be made (e.g. 8) = 18. 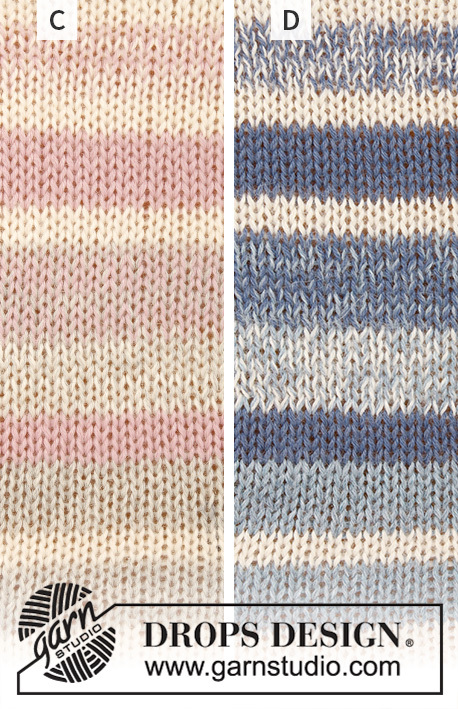 In this example, decrease by knitting together each 17th and 18th stitch. See diagrams A.1 and A.2. 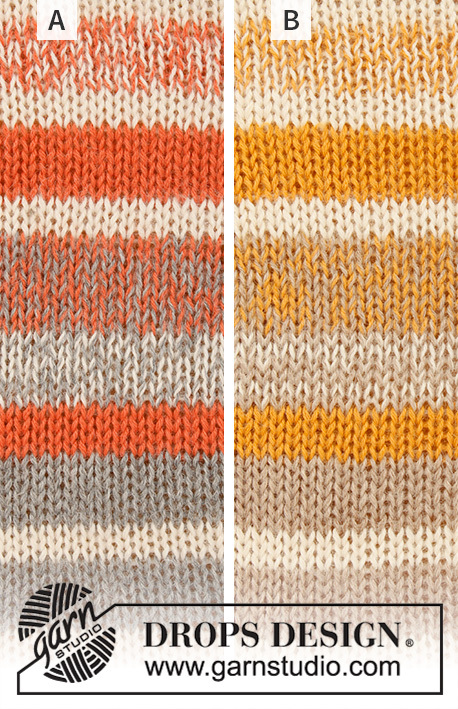 A.1 shows stripes for body and A.2 stripes for sleeves. 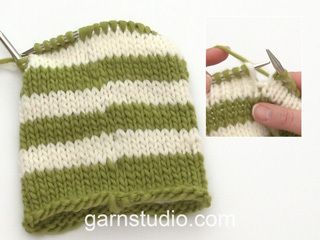 All rounds/rows are worked in stocking stitch. Work until there is 1 stitch left before marker thread, 1 yarn over, knit 2 (marker thread sits between these 2 stitches), 1 yarn over. On next round knit yarn overs twisted to avoid holes. The piece is worked in the round with circular needle as far as the armholes, and then the front/back pieces are worked separately, back and forth on needle. Sleeves are worked in the round with double pointed needles; change to short circular needle when there are enough stitches. Cast on 144-156-172-184-204-224 stitches with circular needle size 5 mm and 1 strand off-white and 1 strand light camel. 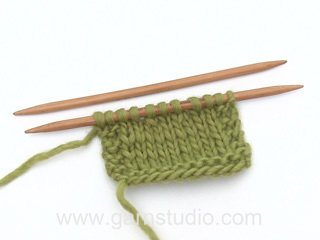 Knit 1 round, then work rib (= knit 2 / purl 2) for 6 cm. 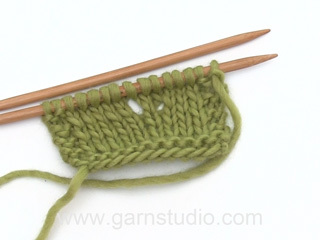 Change to circular needle size 5.5 mm and knit 1 round where you decrease 8 evenly spaced in all sizes – read DECREASE TIP = 136-148-164-176-196-216 stitches. Work stocking stitch until the piece measures 13-15-16-18-19-21 cm from the cast-on edge. Then work STRIPES – see diagram A.1. AT THE SAME TIME when the piece measures 36-37-38-39-40-41 cm, divide the piece for front and back pieces as follows: Cast off 1 stitch, work 67-73-81-87-97-107 stitches (= front piece), cast off 1 stitch and work the remaining 67-73-81-87-97-107 stitches (= back piece). REMEMBER THE KNITTING TENSION! Place the stitches for the front piece on 1 thread. Then work back and forth over the back-piece stitches. = 67-73-81-87-97-107 stitches. Continue working according to diagram A.1, but in addition cast on 1 edge stitch at the end of the next 2 rows (work edge stitches in garter stitch) = 69-75-83-89-99-109 stitches. When you have completed the diagram continue with 2 strands off-white. Work until the piece measures 54-56-58-60-62-64 cm from the cast-on edge. On the next row from the right side cast off the middle 27-27-29-29-31-31 stitches for neck and each shoulder is finished separately. Cast off 1 stitch on next row from the neck = 20-23-26-29-33-38 stitches left on shoulder. Continue working until the piece measures 56-58-60-62-64-66 cm and cast off. Work the other shoulder in the same way. = 67-73-81-87-97-107 stitches. Continue working according to diagram A.1, but in addition cast on 1 edge stitch at the end of the next 2 rows (work edge stitches in garter stitch) = 69-75-83-89-99-109 stitches. When you have completed the diagram continue with 2 strands off-white. Work until the piece measures 51-53-54-56-57-59 cm from the cast-on edge. On the next row from the right side cast off the middle 15 stitches for neck and each shoulder is finished separately. Then cast off at the beginning of each row from the neck as follows: Cast off 2 stitches 2 times and 1 stitch 3-3-4-4-5-5 times = 20-23-26-29-33-38 stitches left on shoulder. Continue working until the piece measures 56-58-60-62-64-66 cm and cast off. Work the other shoulder the same way. Cast on 40-40-40-44-44-48 stitches with double pointed needles size 5 mm and with 1 strand light camel and 1 strand off-white. Knit 1 round then work rib with knit 2/ purl 2 for 6 cm. Change to double pointed needles size 5.5 mm and work 1 round stocking stitch at the same time as you decrease 6-4-4-4-2-2 stitches evenly spaced = 34-36-36-40-42-46 stitches. 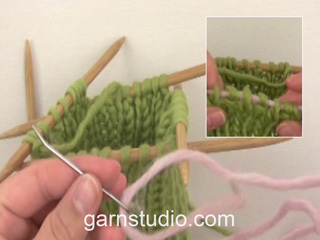 Insert 1 marker thread at the beginning of the round and continue with stocking stitch. READ THE NEXT SECTION BEFORE CONTINUING! When the piece measures 8-8-8-10-10-10 cm, increase 2 stitches mid under sleeve – read INCREASE TIP. Increase like this every 3-2½-2½-2-2-2 cm a total of 15-16-17-17-17-17 times = 64-68-70-74-76-80 stitches – AT THE SAME TIME when the piece measures approx. 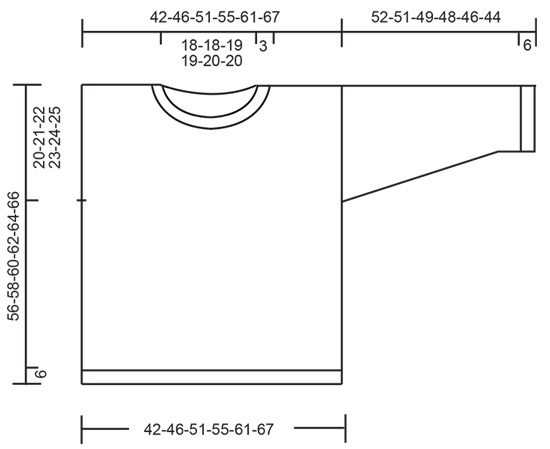 28-27-25-24-22-20 cm work STRIPES – see diagram A.2. When the diagram has been completed, continue with 2 strands off white until the piece measures 52-51-49-48-46-44 cm in all sizes. Cast off. Work the other sleeve in the same way. Sew shoulder seams. Sew in sleeves inside the 1 edge stitch along the armholes. Using a short circular needle size 5 mm and 2 strands off-white, knit up approx. 76-76-80-80-84-84 stitches (number of stitches must be divisible by 4 so that the rib fits). Work rib with knit 2/ purl 2 for 3 cm. Loosely cast off with knit. Om jag vill sticka denna enfärgad, hur mycket garn går det åt då? Hej Lena, det har vi ikke kalkuleret, men du kan nok spare et par nystan. Lycka till! Super cool forårssweater i smukke farver. Wunderschöne Farbauswahl. Bitte unbedingt als Anleitung aufnehmen!! Diese Farben begeistern. Mein Favorit!! Awesome! I would love to knit it!